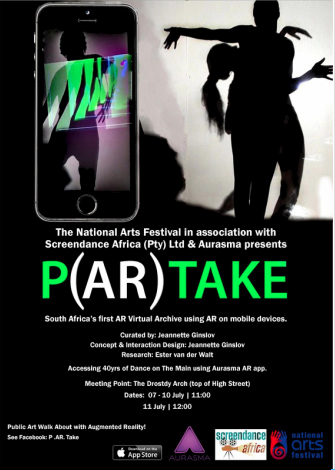 P(AR)take is a virtual archive of South African Contemporary Dance that appeared at the National Arts Festival from 1984 and is accessed by using the free AR (Augmented Reality) app Aurasma on Android or iOS smart mobile devices. With Aurasma one is able to access the archive triggering ten short video clips of South African choreographers' works that appeared on the Main Programme during South Africa's political transformation. Videos were edited and curated by Jeannette Ginslov of Screendance Africa (Pty) Ltd with research assistant Ester van der Walt. Poster: Robert Haxton.